Dark Horse Books, 9781616554279, 384pp. A boy's eleventh birthday heralds the arrival of a bizarre new entourage, a suicidal diva just can't seem to die, and a washed up wrestler goes toe-to-toe with a strange new foe. All of these queer marvels and more can be found at the Nightmare Carnival! 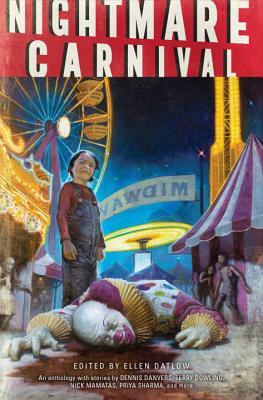 Hugo and Bram Stoker award-winning editor Ellen Datlow (Lovecraft Unbound, Supernatural Noir) presents a new anthology of insidious and shocking tales in the horrific and irresistible Nightmare Carnival! Dark Horse is proud to bring you this masterwork of terror from such incredible creative talents as Terry Dowling, Joel Lane, Priya Sharma, Dennis Danvers, and Nick Mamatas! Multiple award-winning editor Ellen Datlow has been editing science fiction, fantasy, and horror short fiction for almost thirty years. She was fiction editor of OMNI Magazine and SCIFICTION and has edited more than fifty anthologies, including the horror half of the long-running The Year's Best Fantasy and Horror. The awards she has won for her work are too nummerous to list here. To see them please go to ellendatlow.com The author lives in New York, N.Y..